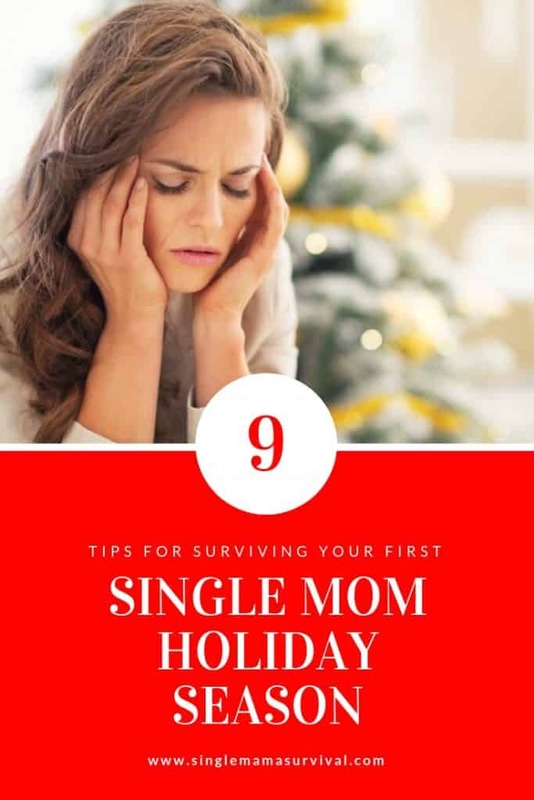 The holiday season usually comes with joy and excitement, but when you are a newly single mom, or in the midst of your relationship crashing, the holiday season is the hardest time of the year. The rest of the world is celebrating while you just want to cry. I remember those first holiday seasons as a single mom, my heart breaking for my kids and myself. I felt so heavy, as if a real physical weight was on my shoulders dragging me down under deep waters. Even the smallest holiday gathering exhausted me leaving me feeling the need to crawl in bed and sleep for days. As I looked at the packed calendar and opened all the Christmas cards filled with smiling faces pouring in the mail, I thought I’d never make it to the New Year. 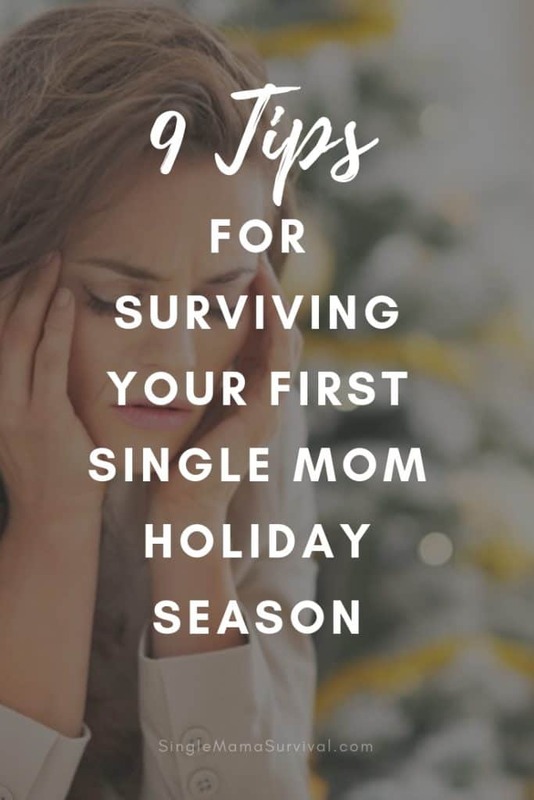 These strategies helped me survive those first holiday seasons after becoming a single mom, I hope they’ll help you too. Don’t pressure yourself to feel festive. This year the only real objective is surviving from November to the New Year. Next year you can work on finding your holiday spirit. It’s okay to just simply survive this year. Have realistic expectations of yourself. Come to terms with the fact that this is not going to be the best Christmas ever. Even when you think your emotions and feelings are under control, they might surprise you. When they do, give yourself grace. Don’t be afraid to let go of some traditions, at least for this year. Skipping a tradition this year doesn’t mean you have to skip it every year. Skip any tradition that feels too hard or overwhelming. This year keep only the traditions that feel comforting. As a single mom, you are creating a new family dynamic, and you’ll eventually need to make decisions about holiday traditions- keeping some, changing others, and making new traditions. However, this first year is not the time to worry about that. That time can be next year- or whenever you feel ready. Remember that this year is all about survival and not about the future. You are going to need some breathing room this year. You don’t need to say yes to every invitation or opportunity. Trust your gut feeling, say yes only when you want to, and say no when you need to. Emotions may come on suddenly, and most definitely unexpectedly. Be prepared to escape if necessary. You might need to leave a situation, such as a party, when it becomes overwhelming. Be ready to be misunderstood. Some people in your life just won’t understand. They’ll think you ought to just brush it off and put on a happy face. They’ll act upset when you decline an invitation. They might see your struggle and remind you that God has a plan for you. And while you may deep down believe that, you’ll really feel like slapping them. Just smile, nod, and walk away. Venting your frustrations and sadness can go a long way in surviving this season. Find a safe place to share your feelings, one where you won’t be judged or told helpless platitudes. Maybe it’s a friend whose been in your shoes, or simply a friend who is a great listener. Many people also find journaling therapeutic. While real life friends who can put their arms around you are the best choice, sometimes they are hard to find. I’ve created a private Facebook group for single moms where we can share our feelings and encourage each other. Sign up at the end of this post for the Single Mama Survival Newsletter and I’ll send you the link to our group. When people offer to help, let them. When you feel overwhelmed ask for help. My first year so many people stepped up to make the holidays amazing for my kids when I just couldn’t. They were my biggest blessing that season. Above all else, give yourself grace. Focus only on surviving to the new year . Don’t feel guilty for taking care of yourself. One year is simply a blink in a lifetime of holidays. You won’t scar your kids by stepping back a bit this year. In the big picture, having a Mama who is taking care of herself is so much more important for your children than checking every possible holiday activity off the list this year. Mama, I know what the heaviness the holiday season brings when your joy is gone. Hang in there, use these tips and you will survive the holiday season. Hang on- the new year is coming!